This three wheel scooter combines exercise, fun and transportation. It has introduced a totally new way to get around! The rider uses both legs to propel the zip scooter forwardand can be used on incline,decline,or flat surfaces. Move your body from side to side to get going and keeps you moving! Padded hand grips for extra comfort. This toy costs approximately £74.99 (for the latest and best prices make sure you check our retailer list for the Zip Scooter Pink and White above). 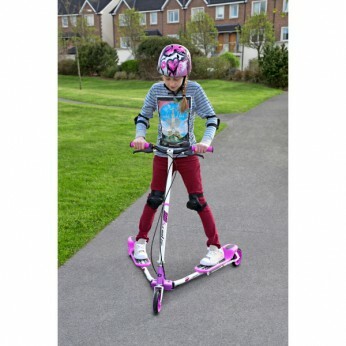 In our review of Zip Scooter Pink and White we classed it as being suitable for ages 8 years, 9 years, over 10 years but recommend you check the manufacturer specific advice before purchasing.